Electrochemical energy is a key factor of biosynthesis, and is necessary for the reduction or assimilation of substrates such as CO2. Previous microbial electrosynthesis (MES) research mainly utilized naturally electroactive microbes to generate non-specific products. 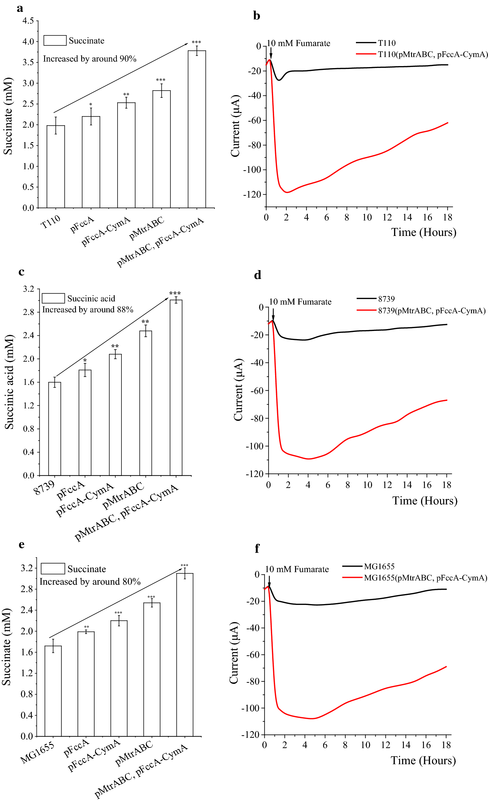 In this research, an electroactive succinate-producing cell factory was engineered in E. coli T110(pMtrABC, pFccA-CymA) by expressing mtrABC, fccA and cymA from Shewanella oneidensis MR-1, which can utilize electricity to reduce fumarate. The electroactive T110 strain was further improved by incorporating a carbon concentration mechanism (CCM). This strain was fermented in an MES system with neutral red as the electron carrier and supplemented with HCO3+, which produced a succinate yield of 1.10 mol/mol glucose—a 1.6-fold improvement over the parent strain T110. The strain T110(pMtrABC, pFccA-CymA, pBTCA) is to our best knowledge the first electroactive microbial cell factory engineered to directly utilize electricity for the production of a specific product. Due to the versatility of the E. coli platform, this pioneering research opens the possibility of engineering various other cell factories to utilize electricity for bioproduction. Energy is a sine qua non of all biosynthetic processes, and is supplied in the form of chemical energy from the metabolism of substrates or from light through photosynthesis. Moreover, certain microbes were recently found to be able to utilize electric energy for the synthesis of chemical compounds [1–3]. The process in which microorganisms utilize electrons from a cathode to reduce carbon dioxide, glucose or other substrates is termed microbial electrosynthesis (MES) . Due to the necessity for the reduction of CO2 emissions and storage of various forms of renewable electricity, research on microbial electrosynthesis techniques is becoming increasingly popular [1, 5–7]. Microbial electrosynthetic processes are performed in a bioelectrochemical system (BES) for biological reductive reactions, which comprises an anode, a cathode and a reference electrode [8, 9]. Electrons derived from the cathode are transformed into reducing equivalents to power biological processes such as fumarate reduction or CO2 fixation, while an oxidation process occurs at the anode at the same time [10–12]. When the electrons derived from the cathode are used by the fermentative microbial catalysts, the fermentation balance shifts toward the production of more reduced metabolic products [4, 10, 11, 13]. More importantly, it may be possible to reduce CO2 and fix it into organic compounds using the reduction power stemming directly from electric energy. Current MES experiments are mostly based on naturally electroactive microbes, such as S. oneidensis MR-1 [14–16]. While these microbes have high electric activity, the palette of products that can be synthesized is limited to simple compounds such as acetate and formate [10, 17]. Furthermore, there are no mature synthetic biology tools available for these microbes, precluding their engineered into applicable cell factories. Thus, more versatile MES platforms based on model bacteria are needed to expand the capacities of the MES technique. In this study, the electrically-inactive model microbe Escherichia coli was used to study the key factors involved in microbial electric activity, and was engineered into an electroactive bacterium to perform MES. 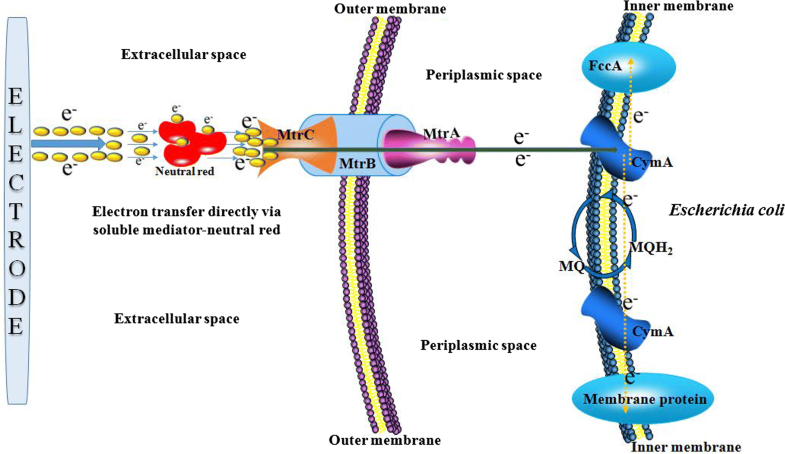 The electron transfer pathway of S. oneidensis MR-1, which consists of a c-type outer membrane cytochrome (MtrC), a periplasmic c-type cytochrome (MtrA), a non-heme outer membrane β-barrel protein (MtrB), and an inner-membrane associated quinol oxidase (CymA) [14, 18], has been established as a model for biological electron transfer . Therefore, we employed the electron transfer pathway from S. oneidensis in E. coli to make it electrically active and able to utilize electric energy in a biosynthetic pathway for CO2 fixation and production of reductive fermentation products. The strains and plasmids used in this study are listed in Table 1. E. coli was cultured at 37 °C in Luria broth (10 g/L Difco tryptone, 5 g/L Difco yeast extract and 10 g/L NaCl). Apramycin Sulfate (50 mg/L; Ruitaibio, China), chloramphenicol (34 mg/L; Solarbio, China), ampicillin (100 mg/L; Solarbio, China), Streptomycin (50 mg/L; Solarbio, China) or β-d-1-thiogalactopyranoside (IPTG,1 mmol/L; Solarbio, China) were used where appropriate. The mtrA, mtrB, and mtrC genes were amplified from S. oneidensis MR-1. The primers pACYC184-K-F and pACYC184-K-R were used for amplifying the plasmid backbone of pMtrABC, including the lacI gene and the trc promoter region. Artificial regulatory part RBS1 was embedded within the primers MtrB-F and MtrC1-F, respectively. The plasmid backbone and DNA fragments were ligated using Golden Gate DNA assembly  to obtain the plasmid pMtrABC. Similarly, the fccA and cymA genes were cloned from S. oneidensis MR-1 and ligated with a pTrac99A-apr backbone using the primers pTrac99A-K-F and pTrac99A-K-R to obtain pFccA-CymA, artificial regulatory part RBS2 was embedded within the primer CymA-F. To construct pFccA, the backbone of the plasmid pFccA was amplified using the primer pair pTrac99A-spe-F and pTrac99A-spe-R from pTrac99A-spe, the lacI gene was obtained from plasmid pTrac99A-M using primers pTrac99A-M-F and pTrac99A-M-R, the FccA gene was amplified from the genome of S. oneidensis MR-1, these three fragments were ligated using Golden Gate assembly. E. coli DH5α (CWBIO, China) was used for cloning and plasmid propagation, while T110 and 8739 served as the chassis strains. pMtrABC and pFccA-CymA have different resistance markers and origin of replication, and are compatible. Primers used in this study are listed in Additional file 1: Table S1. A single colony of the relevant strain was used to inoculate 3 mL of fresh LB medium and cultured overnight at 37 °C under constant orbital shaking at 200 rpm. The resulting seed culture was used to inoculate fermentation medium at 2% (v/v), and anaerobically incubated at 30 °C and 200 rpm in 500-mL (183 mm × 108 mm × 36 mm) anaerobic flasks (ShuNiu, China). After 3 h of cultivation, the culture was induced with 0.1% (v/v) of a 1.0 mM isopropyl β-d-1-thiogalactopyranoside (IPTG) solution, sealed, and incubated for another 16 h under the same conditions. After measuring the OD600, the cells were harvested by centrifugation at 3000×g and 15 °C for 5 min. The obtained cell pellet was washed twice with NBS medium (New Brunswick Scientific, USA) and transferred into 99.99% pure platinum electrode clip of three-electrode bioelectrochemical reactors (Wenoote, China) for the microbial electrosynthesis reaction. The BES chamber was filled with 100 mL of modified NBS (New Brunswick Scientific) buffer solution composing (mmol/L): 25.72 KH2PO4, 28.71 K2HPO4, 26.50 (NH4)2HPO4, 1.00 MgSO4∙7H2O, 0.015 Thiamine HCl, 1.00 Betaine-KCl, with 27.78 or 55.56 glucose. The initial pH of the medium was 7.20, with 100 mM KHCO3 addition to provide CO2 as the carbon source for microbial electrosynthesis. The composition of MES reaction medium used for electroactivity experiment was same as the above mentioned modified NBS buffer, except that no KHCO3 or glucose was presented, but 10 mmol/L fumarate was added as electron receptor. The prepared samples were inoculated with an initial OD600 of 2.0–2.5. The working electrode’s (cathode) initial potential was controlled at − 650 mVAg/AgCl , sampling time was set at 7 days, and sensitivity (A/V) was set at 1.0 × 10−3. The O2 in the anaerobic medium was removed by constant sparging with pure N2 to ensure strict anaerobic conditions until the end of MES. The background current was monitored to ensure it is between − 5 and 0 μA, and the cyclic voltammograms were smooth, showing no significant peaks or waves. After 100 μL of a 10-mM neutral red solution (Sigma, USA) was added into the reaction medium, glucose was added to an initial concentration of 27.78 or 55.56 mM to initiate the MES process. The current was steady between − 10 and − 5 μA. The control group without neutral red showed only background current, demonstrating that there was no intrinsic electron transfer mediators in the medium. BES bioreactors without electrodes were used as negative controls. During the BES reactions, the current formed by the cathode that delivered electrons to the culture was monitored using a CHI1030C eight-channel potentiostat (Chenhua Instruments Co., Ltd., Shanghai, China). The BES platform for E. coli used in this research is shown in Fig. 1. Figure 1a and c represent the bioreactor with electricity, the green electrode is the working electrode (cathode), the red electrode is the anode, and the white electrode is the reference electrode. In the three-electrode reactor, the electrodes were linked with the potentiostat for electric control and measurements. The cathode was the working electrode, Ag/AgCl was the reference electrode, while the anode was the counter electrode. All potentials were reported with respect to the Ag/AgCl reference electrode. There was a gas vent for gas output between the positions of the three electrodes, as well as a gas inlet equipped with a needle and a 0.22 μm filter for delivering the high purity nitrogen. Figure 1b and d illustrates the BES bioreactor without electricity input. This negative-control reactor only had the gas vent and the inlet. The E. coli MES reaction chamber constructed and used in this research. a The MES chamber supplied with electricity. The white electrode represents the reference electrode, the green electrode is the cathode, and the red electrode is the anode. A needle equipped with a sterile 0.22 μm filter (yellow) is the nitrogen inlet, and there is a gas vent between the three electrodes. b The MES chamber without electricity supply used for the control experiments. c The schematic diagram of the MES chamber supplied with electricity. d The schematic diagram of the MES chamber without electricity supply used for the control experiments. Control, measurement and analysis of the electric parameters were conducted using a CHI1030C eight-channel potentiostat (Chenhua Instruments Co., Ltd., Shanghai, China). A CHI115 platinum wire electrode and a CHI111 Ag/AgCl electrode (Chenhua Instruments Co., Ltd., Shanghai, China) were used as the counter electrode and reference electrode, respectively. A 2 × 2 cm carbon cloth pretreated with an 8% H2SO4 solution was nipped using the platinum electrode holders, and was used as the working electrode. The BES was operated in batch mode at room temperature (25 °C), in a 100-mL blue cap bottle (99 mm × 57 mm × 30 mm × 40 mm, ShuNiu, China). The three electrodes were inserted into the bottle via the cap. Pure nitrogen (N2) gas was sparged continuously into the reaction medium in the BES to maintain anaerobic conditions, while the BES chamber was stirred using a magnetic stirrer at 200–250 rpm. To collect membrane-associated MtrA, MtrB, MtrC, CymA and FccA, cell membrane was extracted with the protocol: (1) Prepare the 500 mL-fermentation medium of the strains E. coli T110 and T110(pMtrABC, pFccA-CymA), then the cells are harvested by centrifugation at 3000×g for 10 min, (2) the cell pellet is redissolved using 15 mL PBS buffer (pH 7.0), followed by cell crushing for three times using the high-pressure homogenizer (JNBIO-3000 PLUS, China), (3) the cell suspension is centrifuged at 8000×g for about 60 min, (4) discard the pellet and collect the supernatant for the next step, (5) the membrane proteins are collected by centrifugation at 200,000×g using the ultracentrifuge (Optima L-100XP, Beckman, USA). The preparation of protein sample was as follows: (1) the collected membrane protein is dissolved using the 2.5 mL protein lysate (8 M urea, 1% DTT) and mixed well, (2) the suspension is centrifuged at 10,000×g for 15 min, 18 °C, (3) collect the supernatant into the 2 mL centrifugal tube and repeat this step once, and the samples are stored at − 80 °C for analysis or mass spectrometry. Samples comprising 1 mL of the reaction mixture were obtained, and the supernatants were used for the analysis of the relevant metabolites including organic acids and residual glucose, using an Agilent 1260 series high performance liquid chromatography (HPLC) system (Agilent, USA), equipped with a refractive index detector and a Bio-Rad Aminex HPX-87H ion exclusion column (300 mm × 7.8 mm, Aminex, USA), which was kept at 35 °C and eluted with 5 mM H2SO4 at a flow rate of 0.5 mL/min; the injection volume was 20 μL . The cathode was poised at − 650 mV in all the experiments. The curve of current versus time (i–t curve) was used to detect current changes during the entire process of BES reactions. The SDS-PAGE was run using the commercially purchased SurePage™ Gels (GenScript, Nanjing). The protein mass spectrometry was performed using the OrbiTrap Fusion LUMOS Tribrid Mass Spectrometer (LC–MS) (Thermo Fisher, USA) and the methods could be referred to references [21, 22]. The significance of differences between mean values of control and test samples was compared by Student’s t-test, using the open-source software “R” (http://cran.r-project.org/). Differences with p < 0.05 were regarded as obvious, p < 0.01 as significant, and p < 0.001 as very significant. In this study, we built an MES system according to previous reports (Fig. 1 and Additional file 1: Fig S1) [1, 10, 23]. In this system, the cathode was the working electrode, which gave out electrons to electron carriers, which in turn transferred the electrons to the microbes in the media. The other two electrodes were the Ag/AgCl as the reference electrode, and the anode as the counter electrode. To test the function of the MES system and screen for an appropriate electron carrier for subsequent experiments, neutral red, riboflavin, 2,6-dichloroindophenol, potassium ferricyanide, and Lauth’s violet were tested in a simple MES reaction in this system. The MES reaction used for testing was a simple one-step fumarate reduction reaction in the cells, in which a fumarate molecule accepts two electrons and is reduced to succinic acid. With 10 mM fumarate as a reaction substrate, the amount of the produced succinate was measured as an indicator of electron transfer efficiency. Although all carriers showed low efficiency, the results showed that a relatively high production of succinic acid could be achieved with neutral red as the electron carrier (Fig. 2a). Therefore, the designed MES was shown to be functional, and neutral red was adopted as the model electron carrier in this study. Due to the reported toxicity of neutral red to living cells , the optimal concentration was determined to perform MES for E. coli T110. With the OD600 nm value as the evaluation index of living cell number, various concentrations of neutral red (0, 0.001, 0.01, 0.05, 0.1, 0.5, 1.0 and 5.0 mM) were incubated with E. coli T110 with an initial OD of 0.5 for 12 h. Based on the results (Fig. 2b), when the neutral red concentration was in the range of 0.05, 0.1 and 0.5 mM, the cell growth was affected corresponding to the concentrations. In the range of 1 and 5 mM, the cell growth was significantly affected. And in the range of 0, 0.001 and 0.01 mM, the cells could keep up the growth. We have also done the same experiment with E. coli 8739, and the experimental result was as shown in Additional file 1: Fig. S3. E. coli 8739 exhibited a very similar pattern as the E. coli T110 with different concentrations of neutral red, except the final OD600 values were generally higher than that of E. coli T110 in the range of 0, 0.001 and 0.01 mM. Therefore, the optimal neutral red concentration for both strains was 0.01 mM. Based on the previous experimental results of optimization of neutral red concentrations, the neutral red with a concentration higher than 0.01 mM was toxic to E. coli cells. We selected the neutral red concentrations below 0.01 mM including 0.005 and 0.01 mM, but also above 0.01 mM including 0.02, 0.03 and 0.04 mM, to investigate the effect of different neutral red concentrations on the current with strain E. coli T110 (pMtrABC, pFccA-CymA). The experimental results were shown as in Additional file 1: Fig. S4, that the current increased significantly when the neutral red concentration was raised from 0.005 to 0.01 mM. But in the range from 0.01 to 0.04 mM, the increasing extent was small. Considering both cell growth status and system current level, 0.01 mM neutral red was selected to perform the MES experiments in this work. Previous reports have demonstrated the successful heterologous expression of mtrC, mtrA and mtrB of S. oneidensis MR-1 in E. coli [25–27]. Moreover, the localization of MtrA, MtrB and MtrC in E. coli was similar to that in S. oneidensis MR-1 [18, 28–30]. Furthermore, CymA from S. oneidensis MR-1 was functionally expressed in E. coli, and the membrane-bound protein NapC of E. coli was found to probably have a similar function to CymA [31, 32]. These two proteins both transfer electrons from menaquinol to the periplasmic terminal electron acceptor complex . Thus, we designed an electrosynthetically active E. coli cell as illustrated in Fig. 3. In the theoretical model, the heterologously expressed MtrABC complex was assembled in the E. coli membrane, which allowed the input of electrons transferred from electron carriers. Afterwards, the electrons inside the cell were delivered to menaquinone or other biological carriers inside the cell and transformed into reducing power for biosynthesis reactions. To determine if the heterologous proteins MtrA, MtrB, MtrC, CymA, and FccA were successfully expressed in E. coli cells and presented in the membrane compartment, three experiments were performed including fluorescent tag location tracing, SDS-PAGE of extracted membrane proteins, and protein mass spectrometry of membrane proteins. To analyze cellular localization of the expressed membrane proteins, RFP protein was used as a reporter protein. The genes of membrane proteins were fused with the rfp gene respectively for making reporter fusions. The strain E. coli T110 without expressing the membrane protein from S. oneidensis was used as the control, which only expressed the RFP reporter protein. And the strain E. coli T110(pMtrA-RFP), T110(pCymA-RFP) and T110(pFccA-RFP), which had MtrA, CymA and FccA fused with RFP respectively were the experimental group, and the constructed plasmid maps were as shown in Additional file 1: Fig. S5. The fluorescence microscope Leica™ DM5000B was used for measuring RFP fluorescence at respective excitation and emission wavelengths of 557 and 590 nm, using a 100× oil-immersion objective. However, the quality of the fluorescence microscopy images is not ideal. We have repeated the practice for a few times, but the best fluorescent images we could obtain was still somewhat vague. Thus, we did not put these images as formal manuscript figures but left them in supplemental files as shown in Additional file 1: Fig. S6. In Additional file 1: Fig. S6a, the control without membrane protein showed RFP filled with the whole cell, indicating that there is no membrane localization occurred. However, in Additional file 1: Fig. S6b–d, we could see that RFP fluorescence was more distributed towards the edge of cells. The fluorescent microscopy results indicated these membrane proteins was possibly located with the membrane compartment. Since the image quality is low, we had to perform the following experiments to illustrate their location status. SDS-PAGE of proteins associated with membranes were performed for determining the expression of MtrA, MtrB, MtrC, CymA and FccA, and the result was as illustrated in Additional file 1: Fig. S7. We could see that the control strain E. coli T110 almost had no expression of these proteins, whereas, the strain E. coli T110(pMtrABC, pFccA-CymA) had relatively clear bands matched the sizes of MtrA, MtrB, MtrC, CymA and FccA. The protein mass spectrometry was conducted for further determine the expression of the heterologous membrane proteins derived from S. oneidensis. The result of membrane protein mass spectrometry was as illustrated in Additional file 1: Fig. S8, the detailed identification results of the MtrA, MtrB, MtrC, CymA and FccA proteins were marked in red in Additional file 1: Fig. S8. It was illustrated that while no MtrA, MtrB, MtrC, CymA and FccA were found in the control samples of E. coli T110, all these heterologous proteins scored a “High” in the “Found in Sample” section by the strain E. coli T110(pMtrABC, pFccA-CymA), which indicated the presence of these proteins. With the above three experiments, heterologous proteins MtrA, MtrB, MtrC, CymA and FccA were proved to be successfully expressed and presented in the membrane compartment. To investigate the effects of the key elements for the cells’ electric activity, different combinations of genes derived from S. oneidensis MR-1 were tested in E. coli T110 (Fig. 4a). Similarly, the production of succinate via reduction of fumarate was used as a measure of the degree of electric activity of the engineered cells, as well as the system’s overall electric current. As expected, compared to the control strain T110, all engineered strains, including T110(pFccA), T110(pFccA-CymA), T110(pMtrABC) and T110(pMtrABC, pFccA-CymA), exhibited increased succinate production. The highest succinate production was obtained from strain T110(pMtrABC, pFccA-CymA), which displayed a very significant increase of almost 90% (p < 0.001) over the parent strain. As shown in Fig. 4b, a significantly increased current was observed with strain E. coli T110(pMtrABC, pFccA-CymA) when 10 mM fumarate was added into the MES reaction medium at 0.5 h. The current started decreasing slowly from 2.0 h, and very slowly converged to levels similar to those of the control strain T110, which only exhibited a slowly increasing current from 0.5 h with the addition of fumarate. These results demonstrated that the engineered strain E. coli T110 (pMtrABC, pFccA-CymA) expressed all the necessary genes from S. oneidensis MR-1, and thus displayed a significantly improved electrical activity. We also tested MES medium with no E. coli inoculation as a negative control, and it had no current response with or without fumarate supplementation, as expected. To further improve the engineering strategy and increase the electric activity of other E. coli strains, the representative wild-type strains E. coli ATCC8739 and MG1655 were modified in the same way as T110 (pMtrABC, pFccA-CymA), and MES reactions were performed using the resulting engineered strains under the same conditions. As shown in Fig. 4c and d, the engineered strains E. coli 8739 (pFccA), 8739 (pFccA-CymA), 8739 (pMtrABC), and 8739 (pMtrABC, pFccA-CymA) showed almost the same performance as their counterparts based on the T110 chassis. The succinate production of ATCC8739 (pMtrABC, pFccA-CymA) increased by nearly 88%, and the difference was very significant (p < 0.001). The same was observed for the strains derived from E. coli MG1655 (Fig. 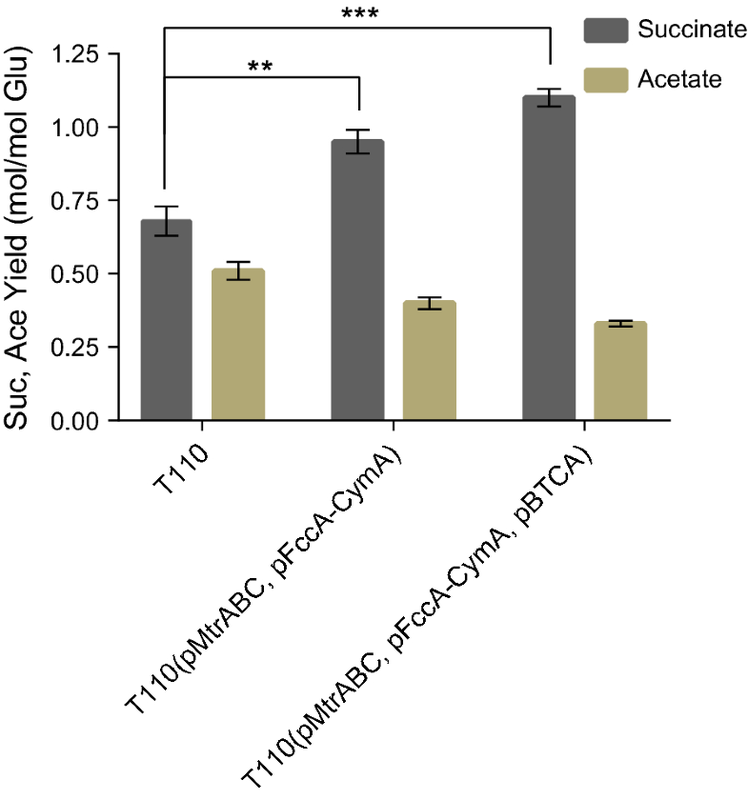 4e, f), whereby the succinate production of MG1655(pMtrABC, pFccA-CymA) was increased by 80% compared with the parent strain, and the increase was highly significant (p < 0.001). A similar trend of increased succinate production and system-wide current of the three groups of strains indicated that this metabolic engineering strategy is probably universally applicable to E. coli. By calculating the electron balance, as known as the coulombic efficiency, in the MES system (Additional file 1: Table S2), the values of the coulombic efficiency of these processes were at the range of 100–300%, which indicated that the mole value of electrons delivered by the current to the reduced fermentation products did not stoichiometrically account for the increased succinate. In fact, the increased succinate mole value was larger than electrons delivered to the system, similar to the data presented by some other reports [4, 34, 35]. A possible hypothesis was that only a portion of succinate was directly reduced by the accepted electrons, while the other portion of succinate production was due to the cell response to the low redox-potential environment induced by the delivering of the electrons, which led to the increased succinate production from fumarate compared with the condition without electricity in the MES system [4, 34, 35]. Bioelectrochemical techniques offer a promising way to supply reducing power to intracellular electron carriers, such as NADH, by providing electrons through a cathode, enabling the biotransformation and biosynthesis of a number of reduced products [36, 37]. In previous experiments, the electric activity of E. coli 8739(pMtrABC, pFccA-CymA) was evaluated using the simple one-step fumarate reduction. To perform a more presentative MES reaction, glucose was used as the carbon source. The supplemented 55.56 mM glucose was totally consumed at room temperature within 7 days with and without electricity, and the resulting fermentation products, including succinate, lactate and ethanol were analyzed (Table 2). With no electricity in the MES system, E. coli 8739(pMtrABC, pFccA-CymA) performed a normal mixed-acid fermentation with acetate and ethanol as the major fermentation products at similar molar ratios. When the MES system was supplied with electricity, the fermentation product spectrum was significantly shifted towards the more reduced end. The molar proportion of reduced products, including lactate and ethanol, was significantly improved, while the proportion of the oxidized product acetate decreased at the same time. The lactate yield increased 2.2-fold from 0.10 to 0.22 mol/mol glucose, and ethanol increased 1.5-fold from 0.63 to 0.96 mol/mol glucose. A successful MES reaction was thus performed using the electroactive E. coli 8739(pMtrABC, pFccA-CymA), and electricity was utilized in the MES system to produce more reduced fermentation products from glucose. The results suggested that the cells in the experimental group supplemented with electricity obtained excess reducing power that was not available to the control group. Therefore, more reduced metabolites were produced to consume the excess reducing power and balance the intracellular redox state [38, 39]. The intracellular reducing power is stored in the form of reduced cofactors such as NADH, FAD and CoQ, indicating that some of the cofactors had accepted electrons and were reduced with supplementation of electricity in the MES system [40–43]. During this electrosynthesis fermentation process, a charge of 69.6 ± 5.5 °C was transferred to the anode, equal to 0.72 ± 0.06 mM of electrons, and the increased reduced products had a total mole amount of 4.55 mM (Table 2). Thus, the coulombic efficiency MES reaction of E. coli 8739(pMtrABC, pFccA-CymA) was calculated to be 632%. Similar to the previous fumarate reduction MES reactions, the coulombic efficiency was larger than 100% again. We hypothesized that the electricity-driven reducing power might affect the intracellular redox potential and hence metabolite profiles, and facilitated a higher production of reduced metabolites products, such as succinate, lactate, ethanol [4, 35, 44, 45]. In our previous work, the succinate-producing strain E. coli T110 was constructed mainly by eliminating competing fermentation pathways and activating phosphoenolpyruvate carboxykinase  and the succinate anaerobic fermentation pathway was as exhibited in Additional file 1: Fig S2. In the succinate synthesis pathway, CO2 is fixed in a reaction with phosphoenolpyruvate (PEP) catalyzed by PEP carboxykinase, in which 1 mol of glucose can yield 2 mol of succinate with supplementation of CO2, considering only the carbon balance. However, due to the limitation of internally generated reducing equivalents, the actual yield is much lower. To achieve a higher succinate yield from glucose, internal reducing power was increased by manipulating the metabolic networks, which proved that reducing power was indeed the major obstacle to achieving the maximal succinate yield . Thus, transforming supplemental substrates or energy into reducing power for succinate production might be a good strategy to increase the succinate production, along with CO2 incorporation efficiency. Consequently, an electroactive T110 derivative was engineered to perform the MES with CO2 supplementation to achieve production of succinate with high yield in this study (Fig. 5). The MES reaction catalyzed by the electroactive E. coli 8739(pMtrABC, pFccA-CymA) proved the effectiveness of this engineering strategy, and demonstrated the ability of the engineered E. coli to perform MES in our system. In this MES reaction, KHCO3 was employed to supply the electroactive E. coli T110 with CO2 and HCO3+, and electricity was used as a source of supplemental reducing power (Fig. 5). In all test groups, the 27.78 mM glucose supplemented to the media was depleted in the MES system within 7 days at room temperature. In the control groups without electricity, all three strains had similar succinate yields of around 0.6 mol succinate/mol glucose, with the by-product acetate reaching around 0.5 mol/mol glucose (Table 3). Nevertheless, when provided with electricity, the engineered strains achieved significantly higher succinate yields. T110(pMtrABC, pFccA-CymA) produced 26.39 mM succinate with a yield of 0.95 mol/mol glucose, which was respectively 42.3% and 39.7% higher than that of the parent strain E. coli T110. Considering that the CO2 concentration might become a limiting factor in the succinate production process via MES, the intracellular CO2 was increased by employing a carbon-concentration mechanism (CCM) derived from cyanobacteria, which was proved to be functional in E. coli . To do so, the bicarbonate transporter (BT) and carbonic anhydrase (CA) genes from Synechococcus sp. PCC7002 were overexpressed simultaneously in T110(pMtrABC, pFccA-CymA) [49, 50]. As illustrated in Fig. 6 and Table 3, the resulting strain T110(pMtrABC, pFccA-CymA, pBTCA) showed an even more prominent improvement of succinate production. It produced 30.56 mM succinate with a yield 1.10 mol/mol glucose, which represented 64.7% and 61.8% increases over the original strain E. coli T110, respectively. Statistical analysis of the results revealed a significantly higher succinate yield in this strain than in the parent T110 (p < 0.001). During this electro-fermentation process, a charge of 72.6 ± 6.5 °C was transferred to the anode in the MES system, which corresponding to 0.75 ± 0.07 mM of electrons. The coulombic efficiency of increased succinate by E. coli T110 was determined to be 50.7%, and that of E. coli T110(pMtrABC, pFccA-CymA) and T110(pMtrABC, pFccA-CymA, pBTCA) was 287.8% and 332.2% respectively. The results thus demonstrate that the introduction of a CO2 delivery system is an effective strategy to increase the succinate yield of electroactive E. coli cell factories. 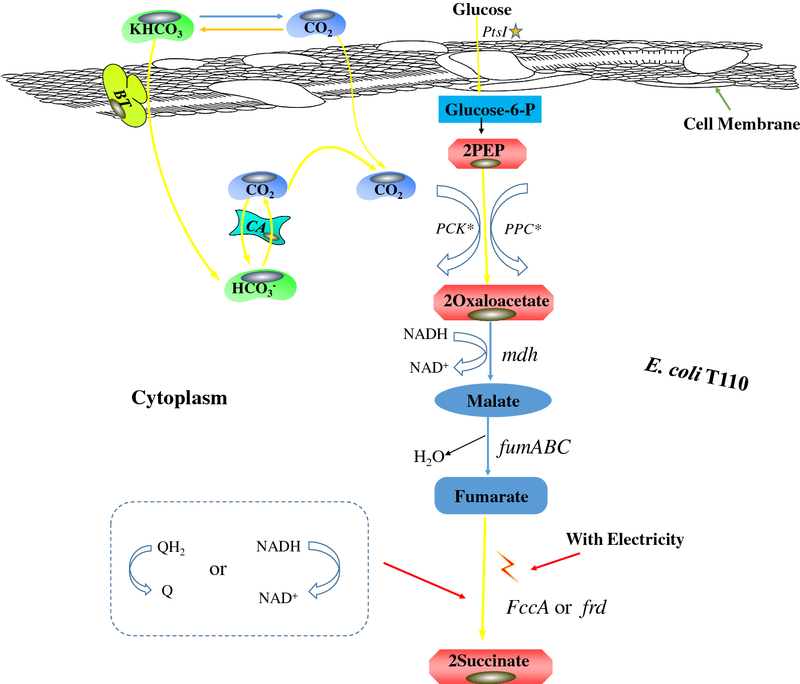 In this research, an electroactive succinate-producing cell factory, E. coli T110(pMtrABC, pFccA-CymA, pBTCA), was obtained by both internal metabolic-network engineering and the introduction of electroactivity, mainly in the periplasm compartment (Figs. 3 and 5). To achieve the maximal succinate yield from glucose, excess reducing power was needed in the succinate fermentation. Thus, we designed an electrosynthetically active E. coli cell as illustrated in Fig. 3, in which the heterologously expressed MtrABC complex was assembled, which allowed the input of electrons transferred from electron carriers. Afterwards, the electrons were delivered to menaquinone or other biological carriers inside the cell, and transformed into usable reductive power for biosynthesis reactions. The best strain T110(pMtrABC, pFccA-CymA, pBTCA) was fermented in an MES system supplemented with HCO3+, with neutral red as the electron carrier, and achieved a succinate yield of 1.10 mol/mol glucose—a 1.6-fold improvement over the parent strain T110. This strain is to our best knowledge the first electroactive microbial cell factory engineered to directly utilize electricity for the production of a specific product. Due to the versatility of the E. coli platform, this research can most certainly be exploited for the engineering of various other cell factories that utilize electricity for bioproduction. Since CO2 fixation is a biosynthesis reaction that requires vast energy inputs, the application of our MES system may provide a solution for the conversion of CO2 into various bio-based chemicals and fuels. A further implementation of this research might enable the commercialization of MES technologies [9, 51]. WZQ and BC planned and performed the experiments, analyzed and interpreted the data. BC, ZX, LJ and WY supervised the study, designed the experiments and analyzed and interpreted the results. WZQ wrote the manuscript. All authors read and approved the final manuscript. We provide all the necessary data for the publication of the article. All supporting data is present in the article and the supplemental material documents. Specifically, the MES system map and DNA sequence data can be found in Additional file 1. This research was financially supported by the Key Deployment Project of the Chinese Academy of Sciences (ZDRW-ZS-2016-3), Grants from the National Natural Science Foundation of China (31522002), Natural Science Foundation of Tianjin (15JCYBJC49400), and the Tianjin Key Technology R&D program of Tianjin Municipal Science and Technology Commission (11ZCZDSY08600). 12934_2019_1067_MOESM1_ESM.docx Additional file 1: Table S1. Primers used in this study. Table S2. The succinate production by electroactive E. coli T110, T110(pMtrABC, pFccA-CymA), 8739, 8739(pMtrABC, pFccA-CymA), MG1655, MG1655(pMtrABC, pFccA-CymA) without electricity in the MES system using 10 mM fumarate as the sole carbon source. Figure S1. 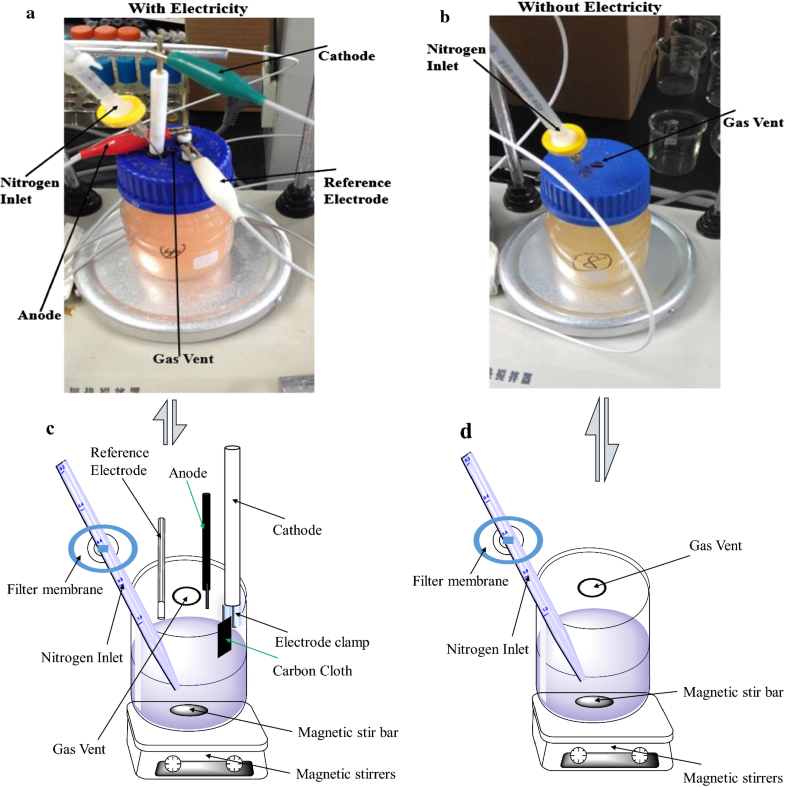 The microbial electrosynthesis (MES) system built and used in this research. Figure S2. Overview of the mixed acid fermentation pathway by E. coli T110 under anaerobic condition. Figure S3. Determination of optimal concentration of neutral red addition by E. coli 8739. Figure S4. The effect of different neutral red concentrations on the current levels with E. coli T110(pMtrABC, pFccA-CymA). Figure S5. The plasmid maps of RFP fusion proteins. Figure S6. The fluorescent images of RFP fluorescence of control strain E. coli T110, and E. coli T110(pMtrA-RFP), T110(pCymA-RFP) and T110(pFccA-RFP) that expressed membrane proteins of MtrA, CymA and FccA fused with RFP reporter protein. Figure S7. SDS-PAGE of membrane proteins extracted from the control strains E. coli T110 and E. coli T110(pMtrABC, FccA-CymA). Figure S8. The protein mass spectrometry for the determination of membrane proteins by the strains E. coli T110 and E. coli T110(pMtrABC, pFccA-CymA).